One year ago today HostDime opened its doors for its newest data center in João Pessoa, Paraíba, Brazil. The 20,000 square foot facility is one of the very few data centers in Northern Brazil. The four story building, designed and constructed by HostDime, is up to Uptime Institute’s Tier III standards. HostDime chose João Pessoa, the capital of Paraíba, to host its operations due to the city’s recent technological boom and a perfect natural-disaster free record with no hurricanes or earthquakes in their history. And here’s a fun fact: João Pessoa is known as the city where the sun rises first, because it is the easternmost city in the Americas. Without further ado, take a virtual tour and behold HostDime Brazil’s flagship data center in all of its glory. 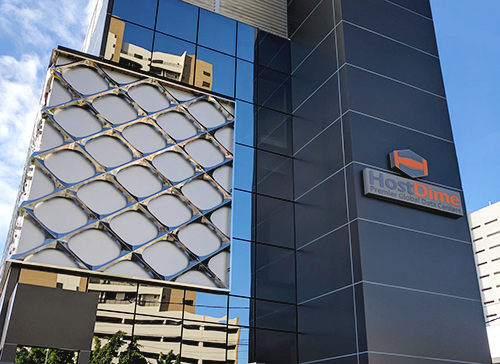 HostDime’s continued growth in Brazil and the demand for data center infrastructure services physically located in Brazil drove the need for this facility, which can support up to 250 racks and also has private cage space for large enterprises. 80% of Brazilian websites are hosted out of the country due to lower costs. This data center aims to lower that number by offering the fastest speeds possible at an affordable rate for locals. By hosting sites in Brazil, latency can be reduced to under 75ms, compared to double that of websites hosted in the US and elsewhere. This network currently has a capacity of 50G via a diverse network of providers such as Embratel, Tely, Telefonica, and Level3. The network is also connected to the local PTT Brazilian peering exchange for Northern Brazil. This facility also provides redundant underground fiber optic points of entry, as well as alternate carrier networks. For the one year anniversary, HostDime Brazil is running a huge sale! Brazil managed dedicated servers have been discounted for a limited time only. To receive the discount seen below, contact our Sales team. This is valid for new server orders only. Setup in 24 hours, or less!